Our transit journey from Tokyo to Sapporo: Tokyo to Shin-Hakodate on the Tohoku Shinkansen - 4.5 hours, 860km travelled. Then Shin-Hakodate to Sapporo on the Hokuto intercity train - 3.5 hours, 300km travelled. Leaving our hotel in Ikebukuro for Tokyo Station at around 9 in the morning, having not activated a rail pass there previously, we lost a bit of time locating the right ticket office in the station, enough to have missed out on getting tickets on the next few trains - instead getting booked on a 12pm train to Shin-Hakodate. While waiting, we plied ourselves with hot beverages, buying bentos for the journey, wasting time consuming wifi catching up on news and the likes. When it was nearly time to leave, we walked up to the platform and lined up to board. To our amusement, two of our companions had never taken a Shinkansen before and were expecting airplane-like facilities, and were super surprised when the train arrived at the station to see how spacious and comfortable looking the facilities were! Anyway, we board the train, took our seats in consecutive rows and the train took off. Three-ish hours later, we find ourselves almost alone on the train, and watch as the "warm" (by our Canadian friends' standards; 5 degrees and "cold" by our Australian ones) surrounds have been replaced by snow-covered forests, the moon light reflecting on it and leaving a strange dark-but-light scene for us. As it prepares to roll into the final station on the line, Shin-Hakodate, our group well rested from the comfortable ride we've just taken, we rug up and prepare our belongings, ready to disembark and board the next leg to Sapporo. Exiting the Shinkansen station, and crossing over the tracks, we now find ourselves standing out in the snow waiting for the next train to arrive. Now, this moment itself was quite spectacular for me. Being an Australian and not having had the opportunity to travel during the typically snow-filled months, being hit by a soft snowball in the dark at 4pm was quite excellent. Expectations high after our journey on the Shinkansen, we wait patiently for 10 or so minutes for the train to arrive. But then it does. An old, fire truck-red, train pulls into the station. Not quite what I was hoping for, but when in Rome, you know, so we board and find our seats. This train is much similar to an airplane: uncomfortable seats with small recline, knees-touching-seat-in-front style legroom. The train fills to capacity, the doors close, and we realise another downfall of this style train: the ventilation system is not great. Within minutes, the train starts to reek of various body odours and tobacco remnants, and the air becomes stale. To top it off, we realise that while it's -6*C outside, inside it's going to be heated above 30C. Yep, there's nothing like sweating uncomfortably in the middle of a snow storm. The train leaves the station, and within minutes I start to feel queasy. I guess because of the terrain, the train operates using tyre-style wheels, similar to a monorail or the Paris metro. Every single bump on the tracks (and there are many) shakes the car. These next four hours are not fun. Finally we arrive. It's nearly 9pm. I've been awake for eleven- or twelve hours, but it feels like it's been days. I'm sure Sapporo is great, but all I want to do is get some food quickly, have a shower, and sleep. After this 'ordeal' (I know, first world problems), we reevaluated our return journey and instead decided to fly. 8+ hours of trains vs less than 2 hours of flights; seems like a no-brainer. Every time we travel to Japan, we calculate the trips we know we're going to make, and try and evaluate if it's actually worth getting a Japan rail pass, or if we should just buy the tickets outright. For our trip, so we could go to Sapporo as well as heading down south, we took a two week rail pass instead of the seven day pass we would've otherwise needed. This added $... to our budget, but was this the right approach? Let's revisit the math and see. Scenario one: adding another 7 days to the rail pass you're already going to buy. Scenario two: getting a fresh 7 day rail pass. It's worth a note that Sapporo does not have an expansive JR network. So the only real benefit you gain from the rail pass is the journey from Tokyo. Once you're here, put the pass back in your luggage. Time saved: between 6-8 hours, each way, depending on pre-planning of ticket reservations. If you're already getting a rail pass and are contemplating getting an extended time one to go to Sapporo, the costs are similar. So this one really depends on how much you like hanging on trains. The first half on the Shinkansen was really enjoyable, but the second part was very uncomfortable. For me, until the Shinkansen reaches Sapporo, flying is the definitely right choice. 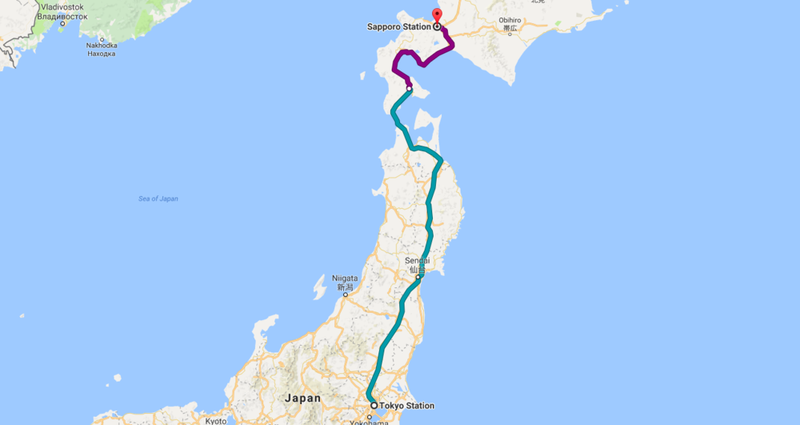 At this stage, the Hokkaido Shinkansen line is expected to reach Sapporo in 2031, so just under 15 years away (Yes, building high speed train lines is hard and takes time). Would we recommend travellers go to Sapporo? However you choose to get there, Sapporo is a very unique and beautiful city, distinct from other Japanese cities we've visited previously - not to mention the amazing snow, too. If you have the chance, you should definitely check it out. And I'm sure we'll have much more to say about the city in the new year! Have you had a chance to visit Sapporo? What was your favourite memories?